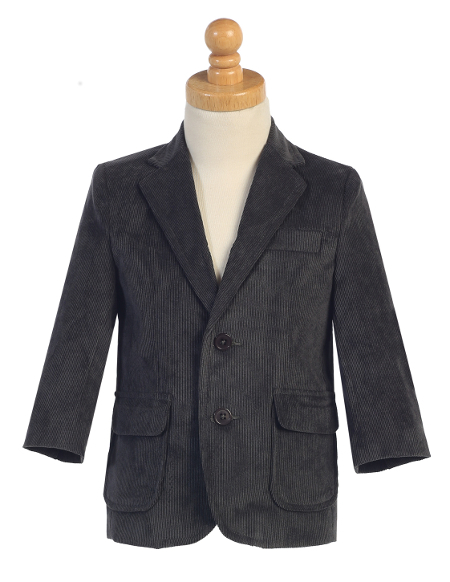 Beautifully designed corduroy blazer by Lito. Perfect for cold Winter and brisk early Spring days. A wonderful edition to your dapper lad's wardrobe. This blazer can add a touch of class to a pair of dress pants or add casual elegance to jeans and chinos. The blazer is available in three color choices: Charcoal Gray, Navy and Black, and is made in the US. Lito cuts their clothing on the slim side so if your little guy is at the top of his size range we recommend ordering up a size. You are welcome to call us for more specific measurements.